Located immediately southwest of the Big Island Gap, this interchange complex was constructed at the same time the Howard Frankland Bridge was built in 1959. It enables motorists to exit southbound or enter northbound at Ulmerton Road or Martin Luther King St N. This interchange complex was a “dead end” for Interstate 275 from the time the Howard Frankland Bridge opened in 1960 (which used to be Interstate 4 back then) until 1970 when work was undertaken to extend Interstate 275 into and through St. Petersburg, eventually linking up with the Sunshine Skyway Bridge and beyond. 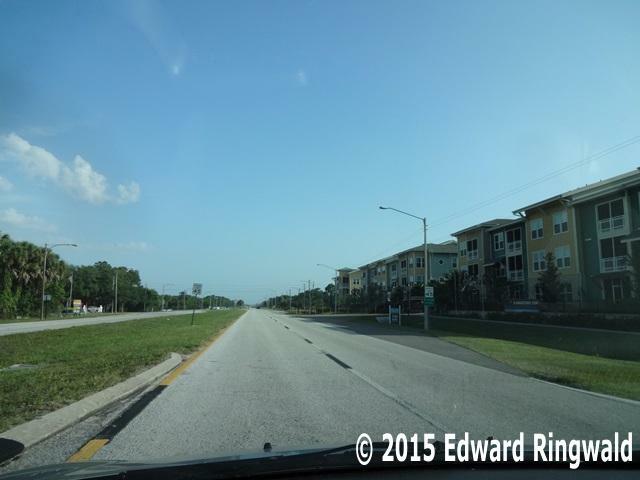 Ulmerton Road (known as FL 688) takes travelers to the Carillon Office Park as well as neighboring Feather Sound. 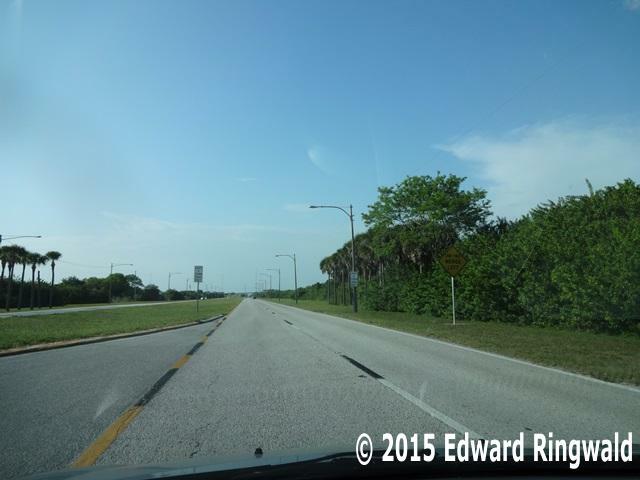 Further west Ulmerton Road takes travelers to Largo and Indian Rocks Beach, ending at Gulf Boulevard (FL 699). Ulmerton Road is notorious for its rush hour backups both in the morning and in the afternoon, especially the section where it is multiplexed with Roosevelt Blvd. 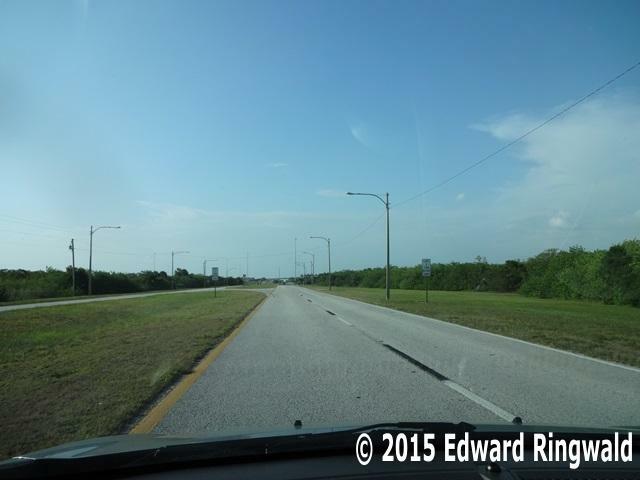 (FL 686) for about a mile. Martin Luther King St N, named for the civil rights leader, takes travelers to downtown St. Petersburg by way of Gateway Mall (now a shopping plaza) and through the picturesque Allendale neighborhood. Downtown St. Petersburg can be reached via 1 Av S or Central Avenue from Martin Luther King St N. Travelers continuing south can see Lake Maggiore and the Boyd Hill Nature Park. Additionally, Martin Luther King St N together with neighboring 4 St N to the east is a good alternative route to Tropicana Field on Tampa Bay Rays game days. 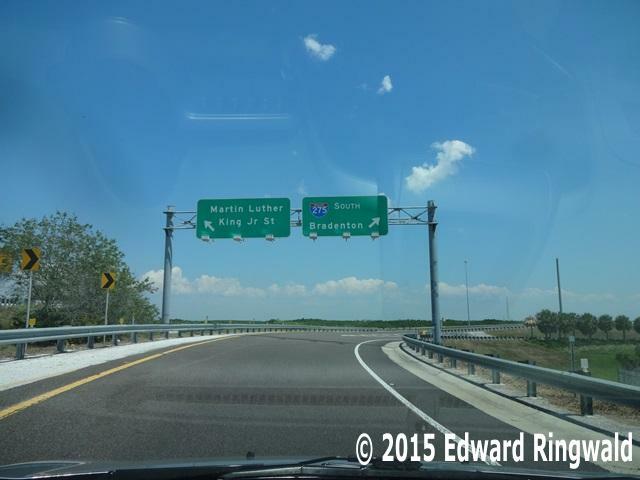 Martin Luther King St N is Pinellas County maintained from Exit 31 southward to the intersection of 94 Av N, which is why the street has the CR 803 designation. South of 94 Av N Martin Luther King St N becomes the maintenance responsibility of the City of St. Petersburg. Formerly known as 9 St N, Martin Luther King St N assumed its current name in 1989 initially on a dually named basis and in 2001, the 9 St N designation was dropped altogether. When this interchange was constructed in 1959 (about the same time as the Howard Frankland Bridge) Exit 31 used to be two exits, Exit 31A being Ulmerton Road (exiting from the right lane) and Exit 31B being Martin Luther King St N (exiting from the left lane). The Interstate 275 southbound mainline lanes curved to the right and then to the left. Those entering Interstate 275 northbound from Ulmerton Road did so in the left lane of the northbound Interstate 275 mainline; the entrance ramp was lengthened in the 1970's with the widening of the bridge carrying Interstate 275's two northbound lanes over Big Island Gap. 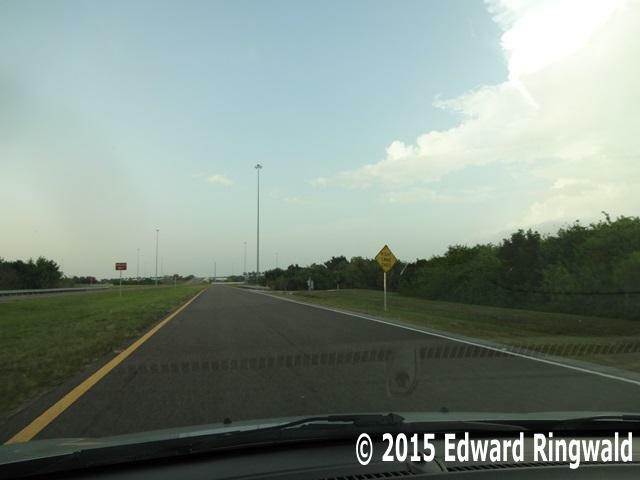 With increased traffic over the years a much needed widening of Interstate 275 at Exit 31 was in order. The improvements made to this interchange in 2004 included the realignment of the southbound lanes of Interstate 275 in a straight ahead trajectory as well as demolition of the original 1959 overpasses to permit widening of the highway from four to eight lanes. In addition, access from Ulmerton Road to southbound Interstate 275 and southbound Martin Luther King St N was constructed. Motorists entering Interstate 275 north from Ulmerton Road now enter the interstate on the right hand side as opposed to the left hand side of the northbound lanes as was past practice. In addition, signage was upgraded making the destinations easier to interpret. 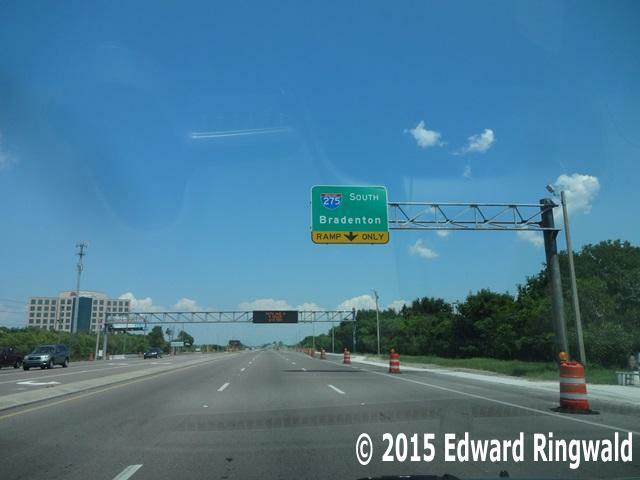 Today Exit 31 is nearly a full service interchange with the exception of northbound Interstate 275 accessing Ulmerton Road and Martin Luther King St N. Perhaps a ramp from northbound Interstate 275 to southbound Martin Luther King St N would be ideal, especially as a last minute exit on the St. Petersburg side before the Howard Frankland Bridge. Currently northbound Interstate 275 motorists who miss the Roosevelt Blvd. 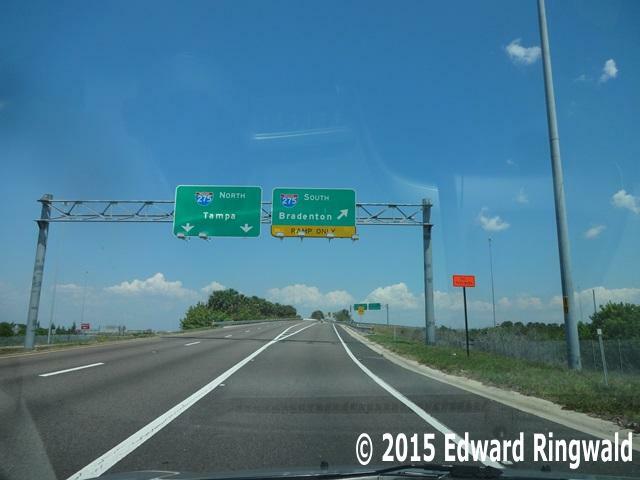 interchange (Exit 30) are committed to crossing the Howard Frankland Bridge into Tampa. 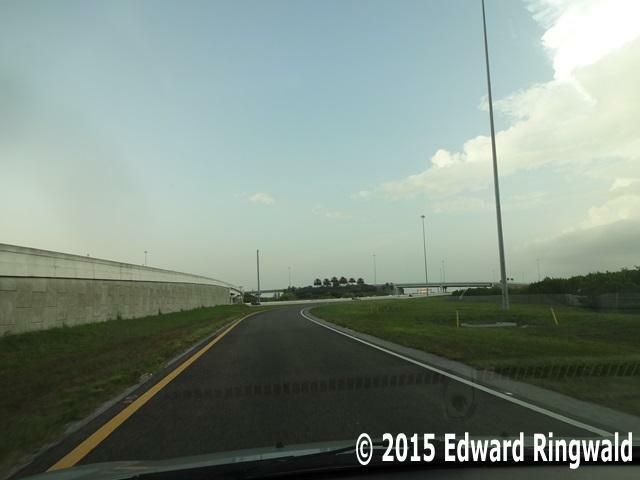 Interstate 275 segment: Constructed as part of the Howard Frankland Bridge project. Interchange Characteristics: Next to full access interchange for both FL 688/Ulmerton Road and Martin Luther King St N; no access to either road from northbound Interstate 275 and no access from northbound Martin Luther King St N to southbound Interstate 275.
Notable Points of Interest: Carillon Business Park as well as central Pinellas county, Seminole and Indian Rocks Beach further west on FL 688. The St. Petersburg-Clearwater International Airport is reached via FL 688 and the western FL 686 (Roosevelt Blvd.) interchange. 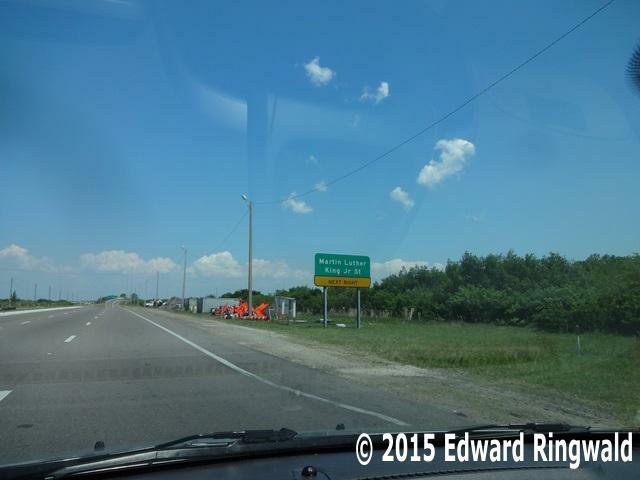 Good to Know: FL 688 maintains the Ulmerton Road name for a majority of its cross Pinellas County route. 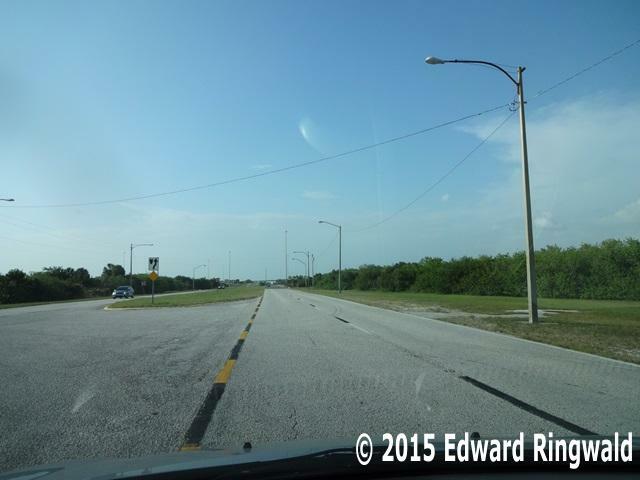 Road name changes from Ulmerton Road to Walsingham Road after curving in a southwest direction west of 113 St N. FL 688 terminates at FL 699 (Gulf Blvd.) in Indian Rocks Beach. Shortly after the Howard Frankland Bridge was built, Interstate 275 - back then as Interstate 4 and later as Interstate 75 when the decision was made to extend Interstate 75 south to Miami - temporarily ended at the ramp to Martin Luther King St N, which was originally constructed as a left hand exit. Copyright © 2000-2017 Edward Ringwald. All Rights Reserved.